One way of reaching the summit is as follows. Leave the Inistioge to Graiguenamanagh road near Sackinstown (S 677 423 E) Go SE along an unsurfaced road into the forest (where the road becomes surfaced) to a point near 685 412 F. Turn left onto the South Leinster Way. By following various tracks, mostly shown on the OS, arrive at S698 412 G, which is a substantial vehicle park at around 332m. (This position was taken by GPS, the tracks on the OS may not be totally accurately shown.) Beyond this, the road deteriorates. From the NE corner of this car park there is a well used track which will lead you to the summit along a ride, a track and over heather. You can actually drive to the car park if you wish to, though beware of bumps and ridges in the road. Picture from murphysw : Someones put up a cross here, Ted! 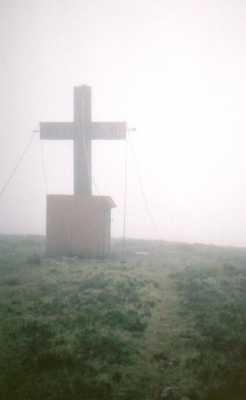 Picture: Someones put up a cross here, Ted! Picture from simon3 : Summit, trig pillar and blockhouse. 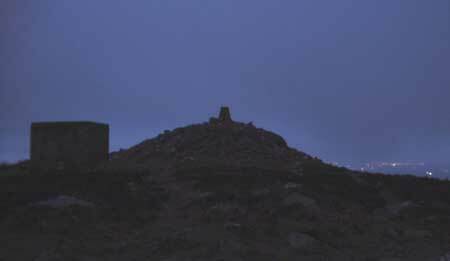 Picture: Summit, trig pillar and blockhouse. According to PW Joyce [Irish Local Names Explained] Brandon Hill is named after St Brendan the Navigator. 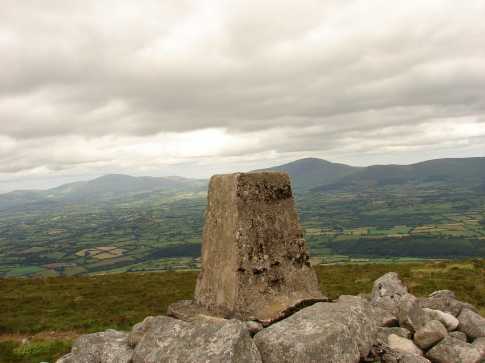 It is an isolated peak around 12k SE of the Blackstairs. 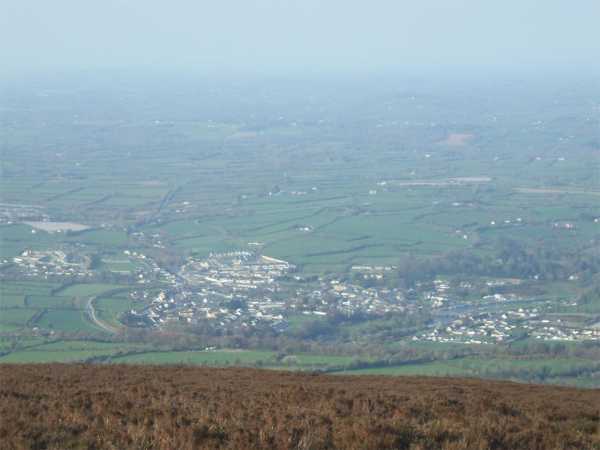 Like the Blackstairs it is mainly made of granite. Like other isolated peaks, the views from Brandon hill are well known for quality, so good in fact that someone has put a direction indicator near the summit. To the NE are the Coppanagh Hills (365m) reputedly interesting for a short walk, though from the map it would appear that the trig pillar on Coppanagh is now in a wood.